^ 2.0 2.1 Federal Emergency Management Agency. Super Typhoon Pongsona: The First 100 Days Over $300 Million In Disaster Relief And Assistance. 2003 [2015-03-22]. （原始内容存档于2013-10-20）. ^ 3.0 3.1 3.2 3.3 3.4 3.5 3.6 Gary Padgett. Tropical Cyclone Summary for December 2002. 2003 [2015-03-22]. （原始内容存档于2013-10-22）. ^ 4.0 4.1 4.2 4.3 Japan Meteorological Agency. 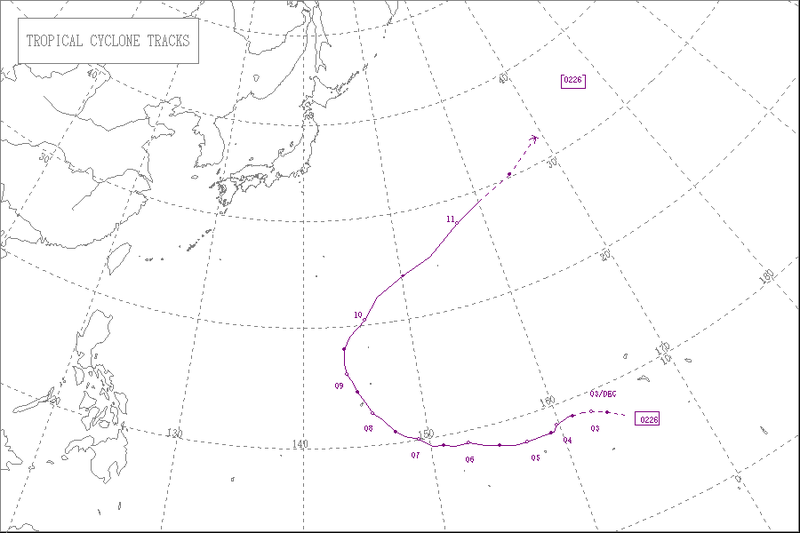 2002 Western Pacific Tropical Summary (PDF). 2002 [2013-10-14]. （原始内容 (PDF)存档于2013-10-14）. ^ 5.0 5.1 5.2 5.3 5.4 5.5 5.6 5.7 John J. Kelly Jr. Super Typhoon Pongsona Service Assessment (PDF). United States Department of Commerce. 2003 [2015-03-22]. （原始内容存档 (PDF)于2013-02-28）. ^ Saipan Tribune. Residents told: Prepare for typhoon. 2002 [2012-02-08]. （原始内容存档于2012-02-08）. ^ 7.0 7.1 Sabina Salas. Brace for impact: Pongsona to hit Guam and Rota this afternoon. KUAM. 2002 [2007-09-27]. （原始内容存档于2007-09-27）. ^ 8.00 8.01 8.02 8.03 8.04 8.05 8.06 8.07 8.08 8.09 8.10 Storm Data and Unusual Weather Phenomena with Late Reports 44 (12). National Oceanic and Atmospheric Administration: 119–121. ^ FEMA. When the Media is a Disaster Victim: How one small Paper kept the world informed. 2003 [2015-03-22]. （原始内容存档于2014-08-08）. ^ 10.0 10.1 Federal Emergency Management Agency. Update on Recovery Efforts in Guam and Rota following Super Typhoon Pongsona. 2003 [2006-09-30]. （原始内容 (DOC)存档于2006-09-30）. ^ Bonnie Gillespie. Hope Prevails Amid Complex Recovery in Guam. RedCross.org. 2002 [2008-12-02]. （原始内容存档于2008-12-02）. ^ Federal Emergency Management Agency. President Declares Major Disaster For Guam Typhoon. 2002-12-08 [2013-01-02]. （原始内容存档于2015-03-22）. ^ 14.0 14.1 FEMA. Coordinating Massive Federal Aid For Guam. 2002-12-13 [2015-03-22]. （原始内容存档于2015-03-22）. ^ FEMA. President Orders Disaster Aid For Northern Mariana Islands Typhoon Response. 2002-12-11 [2015-03-22]. （原始内容存档于2015-03-22）. ^ FEMA. CNMI Disaster Assistance Tops $17 Million For Typhoon Pongsona. 2003-04-03 [2015-03-22]. （原始内容存档于2014-08-08）. ^ FEMA. President Declares Major Disaster For Micronesia. 2003-01-06 [2015-03-22]. （原始内容存档于2015-03-22）. ^ ESCAP/WMO Typhoon Committee. 38th Session of the Typhoon Committee. 2005 [2015-03-22]. （原始内容存档于2014-03-16）.